Mexico Bariatric Center (MBC) surgical staff are continuously broadening their knowledge by attending the National and International seminars related to metabolic and obesity surgery. Two of the lead MBC bariatric surgeons, Dr. Louisiana Valenzuela and Dr. Ismael Cabrera, are attending the 22nd World Congress of the International Federation for the Surgery of Obesity and Metabolic Diseases held 29 August – 2 September 2017 in England, UK. IFSO 2017 brings together world leaders in metabolic and bariatric surgery, including Ethicon (products and services of Johnson & Johnson Medical), and Medtronic (a global leader in medical technology, services and solutions). 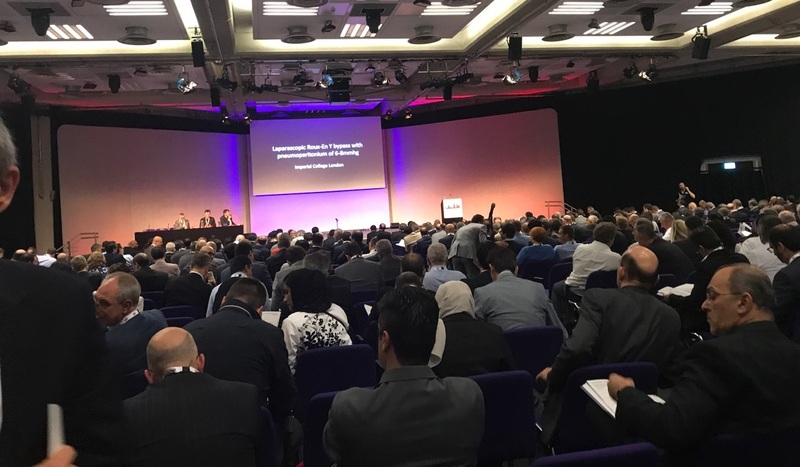 England has been chosen for World Congress of IFSO in 2017 because is one of the most prominent political, financial and cultural centers in the world. With 5 world-class medical schools and over 8000 medical companies, England is the right choice for IFSO 2017. IFSO 2010 – 15th World Congress of International Federation for the Surgery of Obesity & Metabolic Disorders – Long Beach, Los Angeles, California September 3th – 7th, 2010. IFSO 2014 – 19th World Congress of International Federation for the Surgery of Obesity & Metabolic Disorders – Palais des Congrès de Montréal in Montréal, Québec, Canada August 26th – 30th, 2014. Dr. Valenzuela, Dr. Cabrera and Dr. Gutierrez just attended the XIX International Congress of Surgery for Obesity and metabolic diseases June 28 to July 1, 2017 in Playa del Carmen, Quintana Roo. They participated in the academic program of pre-congress courses, transcongreso course and symposium. The congress also analyzed the best surgical options in obesity surgery and revision as well as the management of complications and evaluating the long-term results of bariatric procedures. Obesity is a global threat as nearly 30 percent of the world’s population (2.1 billion people) is overweight or obese. Bariatric surgery is a life-changing treatment to rid of obesity and its life-threatening diseases. Improving surgical community’s access to the most recent techniques, advanced technology and surgical tools help deliver the best outcomes. One of the products presented in this congress worth mentioning is ECHELON FLEX™ GST System from Ethicon. This system is associated with significant lower rate of bleeding and complications. MBC surgeons are on the cutting edge of bariatric technology and are using the latest tools and devices. Ron Elli, Ph.D., director of MBC, has been in medical tourism industry for over 10 years. He has has been focusing on weight loss surgery in Mexico. Dr. Elli is certified by the Medical Tourism Association (MTA) and has been attending all the National and International obesity-related seminars and conferences. 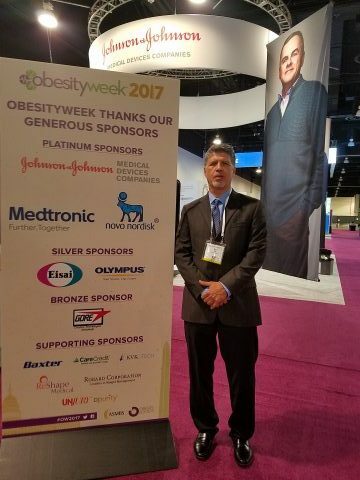 Dr. Elli was an attendee of the 34th ASMBS Annula Meeting at Obesity Week 2017. Obesity Week is an international conference bringing together world-renowned experts and industry leaders in the field of obesity. This event took place at Gaylord National Resort & Convention Center, Washington, DC on October 29 – November 2, 2017. As a leading medical tourism facilitator in Tijuana, Mexico Bariatric Center is committed to the advancements in metabolics and bariatrics. MBC offers reliable and affordable all-inclusive packages for patients in U.S. and Canada. MBC surgeons are capable of handling any type of gastric procedure, such as gastric sleeve, gastric bypass / mini bypass, duodenal switch, gastric balloon and revision of failed surgeries. Mexico Bariartic Center has help hundreds of Canadians to get obesity surgery to avoid long wait time and save money. MBC offers yearly seminars in different provinces of Canada (British Columbia, Alberta, Saskatchewan, Ontario, Quebec, Nova Scotia, etc) to educate patients about the benefits of surgical treatment of obesity as a long-term solution. Check out the next seminar coming to your neighborhood.